Pretty in Pink - Shane Co. Pink has always been one of my favorite colors. Its bright, cheery hue always catches my eye. I was excited when I learned that pink is a natural color of sapphire, an extremely durable gemstone that you can wear every day without worry. Here are some of my favorite Shane Co. pieces featuring pink sapphires. Love stacking rings? Give your stack a pop of pretty color with this lovely band! 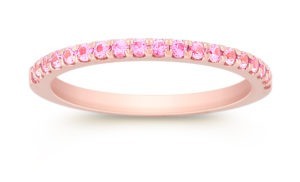 The rose gold setting really brings out the pink color of the sapphires. There’s nothing more special than customized jewelry! 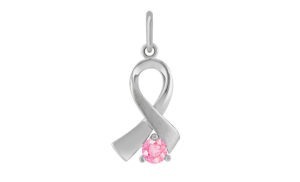 This awareness charm can feature any gemstone of your choosing. 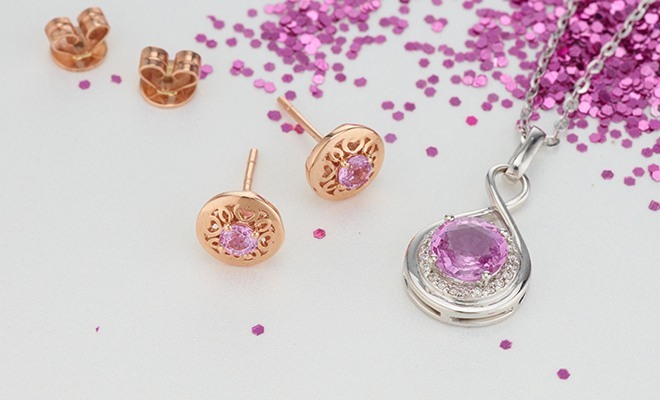 October is Breast Cancer Awareness Month, and choosing a natural pink sapphire is a beautiful way to show your support. 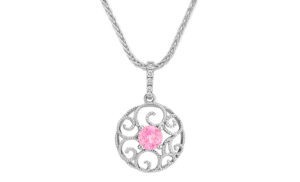 For a simple and delicate splash of pink, add this pendant to your ensemble. Its circle design and milgrain detailing makes it very eye-catching. There’s just something about hearts and pink sapphires together that makes me feel all warm and fuzzy inside. If you want to have that feeling all the time, add this pair of sweet earrings to your wardrobe. The milgrain detailing and leverback design make them perfect for everyday wear. To shop more jewelry featuring pink sapphires, visit ShaneCo.com.